A replica of a "Little Eaton Tramway" wagon. Track has an 'L' cross-section and the wheels are unflanged. A plateway is an early kind of railway or tramway or wagonway, with a cast-iron rail. They were mainly used for about 50 years up to 1830, though some continued later. Plateways consisted of "L" shaped rails where a flange on the rail guided the wheels in contrast to edgeways, where flanges on the wheels guide it along the track. Plateways were originally horsedrawn, but cable haulage and locomotives were sometimes used later on. The plates of the plateway were made of cast iron, often cast by the ironworks that were their users. On most lines this system was replaced by rolled wrought iron (and later steel) "edge rails", which along with realignment to increase the radius of curves converted them to modern railways better suited to locomotive operation. Plateways were particularly favoured in South Wales and the Forest of Dean, in some cases replacing existing edge rails. Other notable plateways included the Hay Railway, the Gloucester and Cheltenham Railway, the Surrey Iron Railway, the Derby Canal Railway, the Kilmarnock and Troon Railway, the Portreath Tramroad in Cornwall and lines at Coalbrookdale, Shropshire. The plates of a plateway generally rested on stone blocks or sleepers, which served to spread the load over the ground, and to maintain the gauge (the distance between the rails or plates). The plates were usually made from cast iron and had differing cross sections depending on the manufacturer. They were often very short, typically about 3 feet (914 mm) long, able to stretch only from one block to the next. 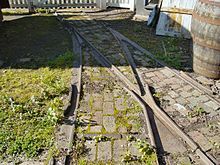 William Jessop had used edge rails cast in three foot lengths, with "fish-bellying" to give greater strength along the length of the rail on a line between Nanpantan and Loughborough, Leicestershire in 1789. However, after he became a partner in Benjamin Outram and Company (Butterley Iron Works) he designed the Surrey Iron Railway and the Kilmarnock and Troon Railway as plateways. An alternative design with the flange on the outside designed to be additionally used with flanged wheels was unsuccessfully trialed on the Monmouthshire Canal Company's line shortly before reconstruction as a modern railway. The early plateways were usually operated on a toll basis, with any rolling stock owner able to operate their wagons on the tracks. Sometimes the plateway company was forbidden to operate its own wagons, so as to prevent a monopoly situation arising. Some plateways such as the Gloucester and Cheltenham Railway were single track with passing loops at frequent intervals. The single track sections were arranged so that wagon drivers could see from one loop to the next, and wait for oncoming traffic if necessary. However others such as the Surrey Iron Railway, the Kilmarnock and Troon Railway and the Monmouthshire Canal Company's tramroads and the Severn and Wye Railway were wholly or partly double track. Plateways tended to get obstructed by loose stones and grit leading to wear. Edgeways avoid the stone obstruction problem. Stone blocks had an advantage over timber sleepers in that they left the middle of the track unhindered for the hooves of horses. Timber sleepers had an advantage over stone blocks in that they prevented the track from spreading, the gauges of some tramroads increased by a couple of inches after decades of horses passing up the middle, but being loose on the axles the wheels could usually be adjusted slightly with washers. Even older than plateways were wagonways which used wooden rails. Despite its ancient appearance, the Haytor Granite Tramway, the track with ledges cut in stone blocks to produce a similar effect as tram plates, was contemporary with plateways, being built in 1820. ^ Byles, Aubrey (1982). The History of the Monmouthshire Railway and Canal Company. Cwmbran: Village Publishing. p. 23. ISBN 0-946043-00-0. ^ Strickland, A. R. & Wilson, R. "The Gloucester and Cheltenham Tramroad 1811-1861" (PDF). Gloucestershire Society for Industrial Archaeology. Retrieved 18 October 2012. ^ Lewis, M. J. T. (1970). Early Wooden Railways. London: Routledge and Kegan Paul. ^ Paar, H W (1963). The Severn and Wye Railway. Newton Abbot: David and Charles. pp. 36–37. ISBN 0-7153-5707-7. ^ Byles, Aubrey (1982). The History of the Monmouthshire Railway and Canal Company. Cwmbran: Village Publishing. p. 13. ISBN 0-946043-00-0. ^ Haytor Granite Tramway and Stover Canal, A Countryside Study. Exeter: Devon County Council. 1985. ISBN 0-86114-559-3.